You bring the vision. Let AwardTraq™ handle the rest. Track real-time performance of your TSR awards. 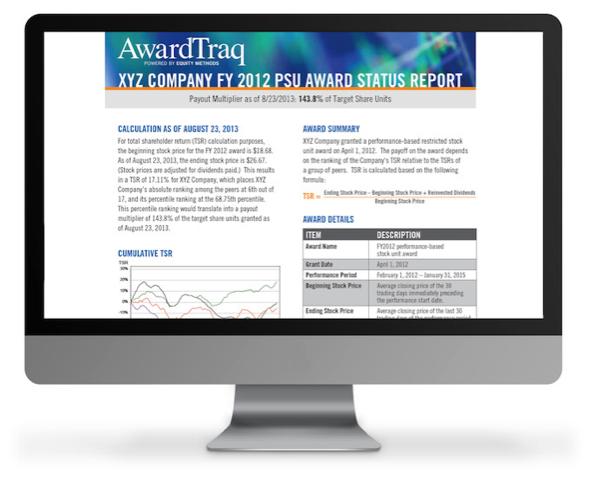 Communicate the current value of your TSR awards in a clear, compelling way. Give participants direct access. Or, use behind the scenes within your own department. Demonstrate the link between pay and performance. With hundreds of moving parts, it’s all too easy for participants to view relative TSR awards as a lottery ticket. They might receive a grant, get a payout some years later, and have no idea what happened in between. There’s not much incentive in this scenario. AwardTraq takes the agony out of tracking and reporting for your most complex, computationally intensive awards. Bring simplicity to error-prone relative TSR calculations. Easily update estimates of contingently issuable shares for ASC 260 compliance. AwardTraq can be customized to handle peer firm M&A, delistings, bankruptcies, equity restructurings, and other corporate events that influence your performance benchmarking. Special dividends, distributions, and stock splits. Non-standard TSR definitions and payout matrix designs.